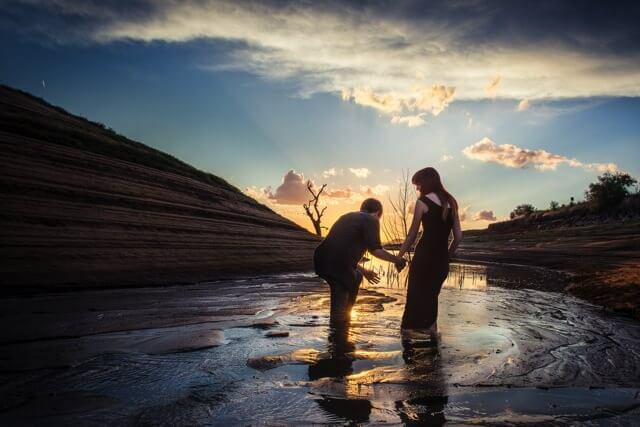 Photographer Benjamin Von Wong decided to seize the opportunity to make a chronically ill fan’s dream come true. 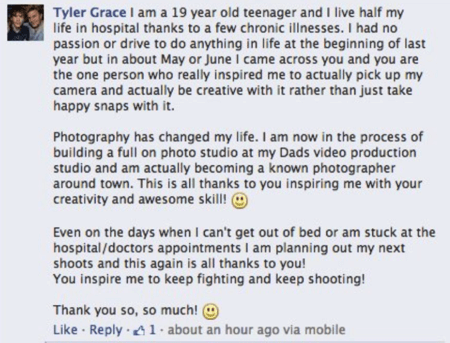 Earlier this year, Grace’s sister messaged the photographer asking if he would record a short “Happy Birthday” video to celebrate her brother’s 21st. Instead, Von Wong decided he’d rather go the extra mile and visit Grace for a weeklong adventure, according to his blog. “At the time, I happened to be touring in Singapore and I thought to myself: When am I ever going to be this close to Australia again? Why just make a video when it was within my power to make an impossible dream come true?” Von Wong wrote. Soon after, he was on his way to surprise Grace and give him a crash course in photography and adventure. During the visit, the two took a canoe trip, went to a rodeo, spoke at a conference to help raise money for the trip and partnered up for a few photo shoots. Von Wong even took the below picture of Grace and his sister. Lucky for us, Von Wong was able to convince a few friends to document their journey in the video below. Grace suffers from a bevy of chronic illnesses. In the video he mentions fibromyalgia, rheumatoid arthritis, nerve damage, parts of marfan syndrome, sleep apnea and insomnia. Grace says that finding Von Wong’s work and taking up photography are what gave him a life worth living. When recapping the trip on his blog, Von Wong said that making Grace’s dream come true was one of the most valuable things he could do with his work. All photos courtesy of VonWong.com.